On November 13, H.E. Mme. 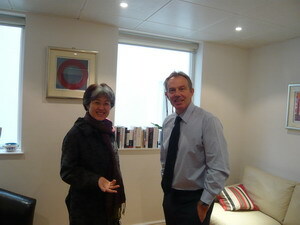 Ambassador Fu Ying paid a visit to Tony Blair, former British Prime Minister and Quartet 's special envoy to the Middle East. Blair denoted that he had made a meaningful visit to China recently. Besides Beijing, Hong Kong and Dongguan, he also visited some rural areas and personally felt the huge changes in China, and had a deeper understanding of China's actual situations and huge challenges. The people of EU need to have a more comprehensive and objective understanding of China and he was willing to make his contribution to that. Fu Ying introduced the development in central and western China. They also exchanged opinions on climate changes and Middle East issue.